Discussion in 'iPhone and iPad Games' started by Codedood, Nov 27, 2013. Puzzle Realms: A Cursed World is a Nonogram puzzle game that features: 50 HAND DESIGNED PUZZLES - Each puzzle is designed to gradually ramp up the difficulty of the game and to be solvable without making you guess or use hints. ENDLESS MODE -As you progress through the game you will unlock endless mode. 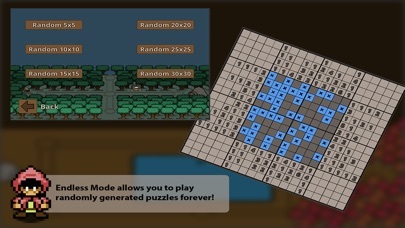 This mode allows you to play randomly generated puzzles for as long as you want. Edit: I am the developer of this game for full disclosure. I only had a chance to play four puzzles before hurrying to work so haven't had a chance to play it to the end of the demo, but i'll definitely be picking up the full game! Edit: Managed to download it in my lunch break. Still absolutely loving it, there are a few small areas that could be improved upon for me. The Fill button is much closer to the Hint button than the Mark button, it'll take a bit of getting used to but in the meantime I instinctive press for Hint instead of Mark. I wouldn't mind so much but there seems to be no confirmation that you want a hint which takes some of the fun away. Additionally, I find Mark and Fill to be odd choices for labelling the buttons. It could just be me, but I spend a little time each puzzle puzzling over which button it is I actually want. How can this possibly be 151.9 mb? It's a nice game with a really cool theme. I think the price is reasonable with the amount of content provided. Random puzzles can be fun, but they can be frustrating at times. The downside on random puzzles: they aren't checked for unique solutions. When there's multiple ways to fill a puzzle correctly, you have to give the answer they want, otherwise you get marked for mistakes. I will be honest - I completely forgot to check the file size of the game. The game definitely shouldn't be that big - the compression on textures must have been turned off. I will be fixing that and some other issues in an update soon. I mentioned this game in my comment on the "Out this Tuesday" news item, this has to be my pick of the week - hopefully it'll be a massive sleeper hit for you. Nice spin on what could be a very formulaic and predictable puzzle game. Really loving the visual style and the writing is decent enough - I'm used to very poorly translated text when it comes to interesting games like this. Thanks! 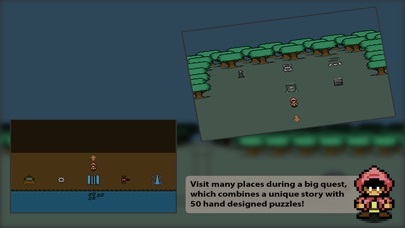 The downloads / sales haven't been all that great yet - but I'm working on making better app store screen shots and a new upgrade screen to better show players that puzzles quickly get much bigger and harder and that 50 puzzles, while not sounding like much, is easily several days worth of content. The Fill button is much closer to the Hint button than the Mark button, it'll take a bit of getting used to but in the meantime I instinctive press for Hint instead of Mark. I wouldn't mind so much but there seems to be no confirmation that you want a hint which takes some of the fun away. Sorry, and thanks for your feedback. Its a simple fix to move the fill button farther away from the hint button and I will be making that change in the next version. In addition, a hint confirmation dialog will be added. The original idea was that I want players to never have to 'confirm' an action as that slows down gameplay - but it seems reasonable to double check if a player really wanted to use an hint. Additionally, I find Mark and Fill to be odd choices for labelling the buttons. It could just be me, but I spend a little time each puzzle puzzling over which button it is I actually want. I honestly agree. In testing I never saw any confusion from players but I still am not entirely happy with the terms Mark and Fill. If you have any suggestions on alternative names I would be interested to hear them. So is it difficult to see the colored cells with the numbers on them after selecting? Or when the colored cells and numbers disappear the fade in isn't fast enough? If you can see the colored cells with numbers on them - I could leave that up while the color fades in and remove it afterwards. Would that help? Again thanks for all the feedback everyone. I hope you continue to enjoy the game. I definitely agree that mixing up the screenshots on the AppStore should help, the biggest draw the game has for me are the larger puzzles and the interior environments. They really show the charm of the Zelda-esque sprites and make it clear it's not your average Picross game. I tried to think of some appropriate phrases to replace Fill and Mark before I mentioned it but I really couldn't, so I can definitely see why you chose them! I looked at a couple of my favourite Picross games and they use visual signifiers like a black square and an X. Not sure if that's a possibility. As for not slowing the game down with confirmations, I definitely agree that's the right thing to do and I appreciate that, it's much better for it. Someone that uses hints, however, is either not interested in playing it too seriously or is stuck and therefore the flow has probably already been broken so I don't think anyone would mind - that's just my thinking on it though. Finally, I played a little (well, quite a bit!) more and found the fading in colour to be less of a problem than I thought it was so I wouldn't worry too much. It's only really in the early levels that it affected me as I tended to solve the puzzle much faster than the effect would work so it was a slight distraction. After the puzzles got larger and the pace slowed down a little, it wasn't a problem. I've said it before, but I love this game. Hopefully you don't take the criticism as anything but wanting it to improve so it can get the attention it deserves! I played like 5 puzzles in the 1st house. then I needed to buy the full game.. Since it's mentioning 50 puzzles. are they all like that ? meaning tiny etc.. cause I will be done within the hour..
No - the puzzles get progressively larger. Most of the puzzles take the average person 15-20 minutes or more to get through. This game was originally intended for a pc audience over at Big Fish Games - who are used to these types are games where this progression is common. But I'm seeing that a lot of people on iOS are confused that the game does get a lot harder than the first five puzzles. 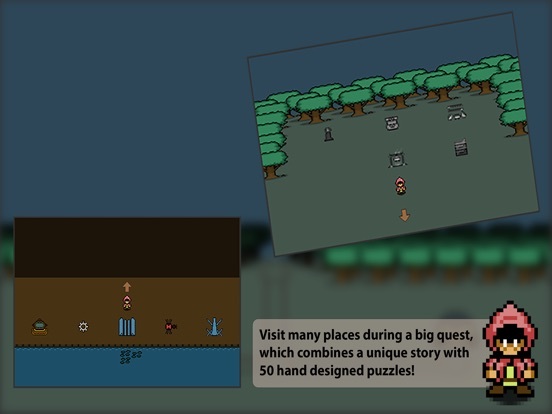 I am working on making the upgrade screen more description to give players a better idea on how hard later puzzles become. To give you some idea - most of my testers spent 4-5 hours playing the game and didn't even get half way done with the game. That's good to hear - glad you are liking it. Don't worry about criticism - it shows that you care enough about the game to think about how it could be better. ok, I'll get it tomorrow then..
What a perfect blend of adventure title and picross. How you came up with this idea I'll never know but not since 10000000 has a game so successfully blended two distinct play styles to come up with an end result greater than the sum of its parts. As for making Mark and Fill less confusing (though it wasn't confusing for me) perhaps making them "Mark" and "Commit and Fill"
But PLEASE... change that "Fill" and "Mark" its getting confusing..
and making me mad when I lose 3 hearts in a row, while meant the other one.. Waiting for an update/improvement if all possible..
Other then that, the game is great..
1. Marking/filling things takes way too long. Go look at Paint it Back and see how smooth and fast the animations are. It should be like that. Right now, the speed is super slow and it makes playing a bit tedious. It also feels less responsive because of the slowness. How do you unfill a square which had been filled accidentally? What also would be nice it to save the puzzle if you want a break.. Thank you all for the feedback. A new 1.1 version is finished and will be submitted to the app store after testing on it is done. 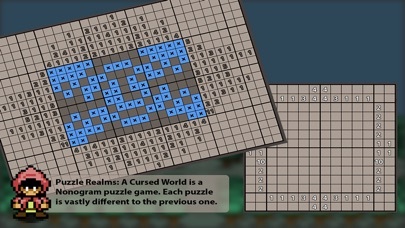 The new UI during puzzles will look as seen on the right with the current UI displayed on the left. You can hit the home button to exit the app and then resume the puzzle you have in progress when you return to the app. Unfortunately, a true saving system would require huge code changes and a lot of testing to make sure it doesn't mess anything up. Its not something impossible - but unless there is a huge demand for the feature it probably won't be implemented. Sorry.